Steven (Chicagoland, United States) on 27 March 2017 in Business & Industry and Portfolio. The “Ransom Carriage” as it is known, is now on a pedestal with a copy of the Omaha World Herald newspaper headlines stating that “Cudahy got his boy back.” There is an image of Eddie Cudahy (the boy who was kidnapped) as part of the famous kidnapping story. A reproduction of the Cudahy sign is also present. The Cudahy family were very prominent in the meatpacking industry in the 1800’s and built several summer homes on Mackinac Island. The ransom carriage is a Studebaker carriage circa late 1890s. It is furnished with a shiny black patent leather side fenders and dash. It is fitted for a single horse. The upholstery is tufted on the single seat and on the sides. 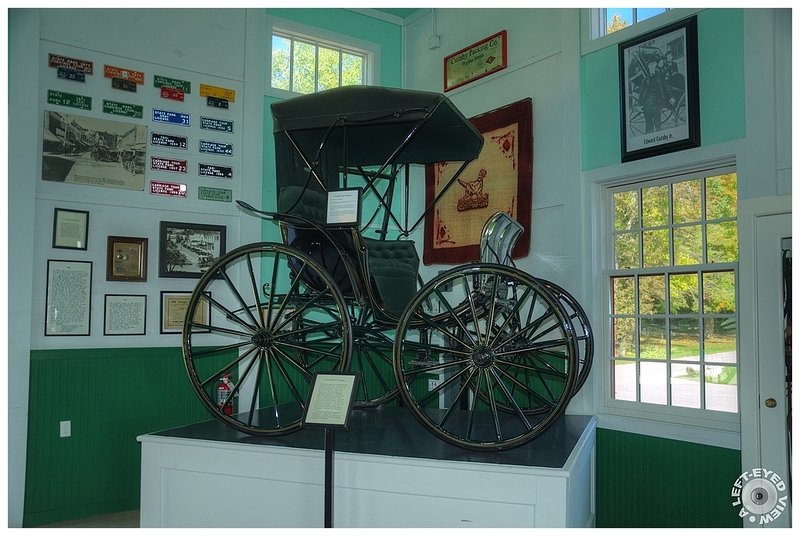 There is also a black collapsible roof that makes the carriage into a convertible in pleasant weather. There is room enough in the carriage to hold two people, possibly three, but how about $25,000 in gold coins, $20 pieces, $10, and $5 (more than 100 pounds in additional weight)? According to those in the know, this was the carriage that made international history in 1900. I tend to think it plausible. And, here it still lives (beautifully restored) on Mackinac Island. It is but another carriage in the Grand Hotel - Mackinac Island Carriage Tours Stable. Although the horse is long dead that pulled the carriage, the tale of the ransom buggy is still fresh in a few minds. The sensation of a kidnapping kept the nation in high anxiety. The players in this drama have real Mackinac Island connections, because they lived in elegant cottages here. The chief characters were none other than Edward Aloysius Cudahy, Sr. and his son, “little Eddie Cudahy” (1884- 1966). But the event happened not on Mackinac, nor in Chicago (which most people here assume). While in Omaha, Edward lived in a sumptuous mansion that took over a city block in its scope and scale. While many of their 2,000 workers lived on meager wages, the Cudahy family lived like royalty. Two disgruntled workers devised a scheme to kidnap Cudahy’s only son and heir, Edward Aloysius, Jr., and they did one evening in December 1900. The boy, who was 16 years old, was walking home after delivering some magazines of his father’s to the local doctor. In the late, dark afternoon of December 18, 1900, he was abducted off a quiet, residential street by two men. A sack was put on his head, his feet and hands were bound, and he was hauled into a carriage and driven off. would be there again in a second if the owners were still there and hiring. Great narrative to go with this . . history comes alive ! What fascinating story - luckily with a happy end for the kidnapping victim - to go with this excellently exposed image! A good image with a shocking story behind. Labor rights have not always existed. But this does not justify a fact like this. Very interesting exhibit and story. An impressive story for a delicious image. Thank you very much for sharing literature and image.... Hugs! Wonderful story and mpressive "car"
Yes I saw the boy in the picture, Eddie Cudahy Jr! I like the fact that they show you the artefacts with supporting pictures, paper clippings that go with the stories. Another fabulous reliq and a very interesting history ... Amazing shot !!! What a sensational story. The narrative was wonderful. Full of suspense! The carriage looks beautiful. The boy is lucky that they just put a sack on his head since the workers most likely worked in the meat packing plant. It could have been much worse! Very cool. There was a 1900 Studebaker for sale near me a couple of years ago. I wish I had bought it.